Does Success Pull in the Punters? This graph was produced to analyse the relationship between a teams form and attendance at football matches as part of an investigation into the factors influencing attendance at football matches. The key question was; Did a winning streak attract higher crowds, or conversely did a losing streak repel them? 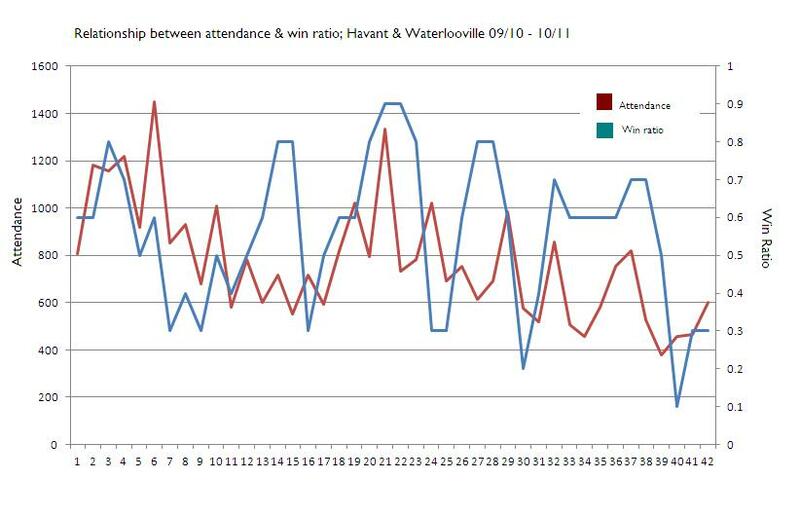 I obtained some data for Havant and Waterlooville FC which included attendance figures and results for a number of past seasons. Choosing 2009/10 and 2010/11, the last two complete years at the time, I then excluded data from cup competitions as attendance for these games varied greatly depending on the prestige of the tournament and the level the opponents played at. The match attendance for each league game, some 42 in total, is represented by the red line whilst the blue line represents a measure of the teams form at that point in time. I created a measure of the teams form by compiling the results of the previous five league games; Awarding 1 point for a won, 0.5 for a draw and 0 for a defeat I calculated a ratio so that say if the team won all their last five games the ratio would be 1.0, but if the team won two, drew one and lost two the ratio would be 0.5. I then plotted both sets of data on a single graph. Whilst not a perfect fit the graph does seem to suggest that there is at least some kind of link between form over the previous five games and matchday attendances. Other factors almost certainly come into play in determining attendances. It may also be interesting to see what the measure of form can be tweaked to be a shorter, or longer time period, or maybe also made to include goals scored or conceded. 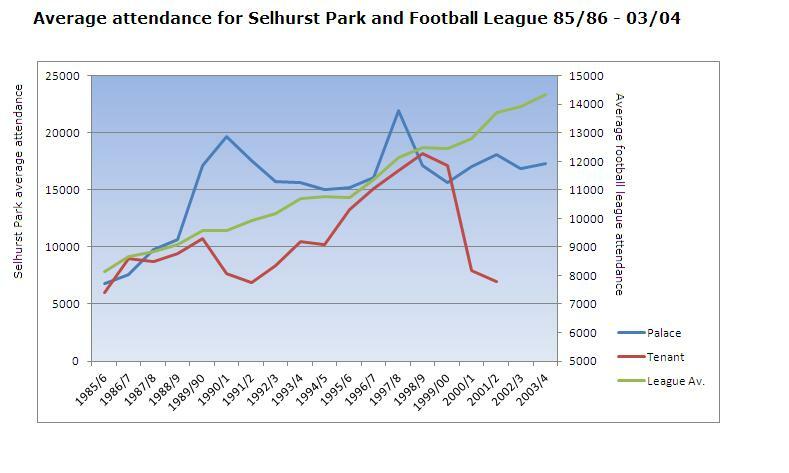 This line-graph came about as part of an investigation into the impact of ground-sharing on the attendance figures of the football clubs involved following an accusation made by a fan of Kingstonian FC that sharing a ground with AFC Wimbledon was having a detrimental effect on their clubs attendances. As part of the analysis, which can be seen in full on my Row Z blog, I decided to look at what is perhaps one of the longest ground-sharing arrangements in the upper-reaches of English football; Between 1985 and 2003 Selhurst Park, home of Crystal Palace FC, also hosted Charlton Athletic (1985-1991) and Wimbledon FC (1991-2003). On the graph I have plotted the average attendance figures for Palace and their respective tenants. 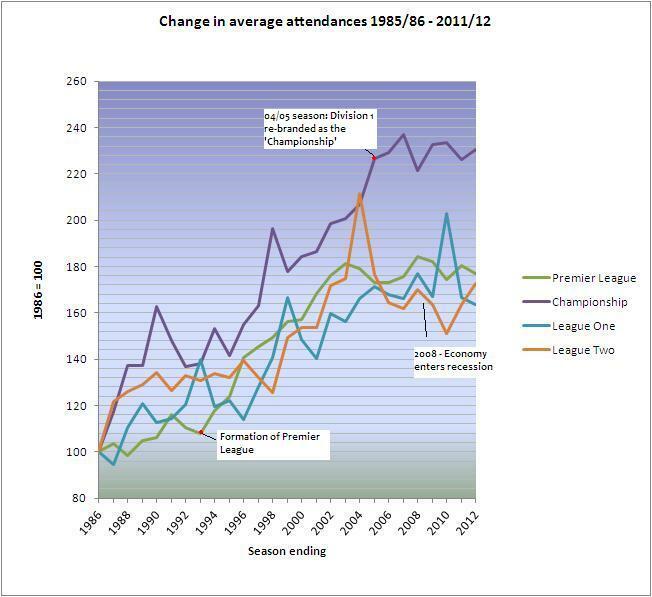 Rather than seeing a relationship where rises in one clubs attendances corresponded with falls in the other clubs attendances (which we would expect if ground-sharing was having a negative impact on one club) it seemed that over the long-term both sets of attendance figures were rising – the nosedive of the ‘tenants’ attendance at the end of the graph is the result of the clubs 2001 announcement that it would be seeking to relocate to Milton Keynes. One explanation for the long-term upward trend is the general rise in attendance at football games which took place at the same time. 1985, the year the graph begins, was a low-point for English football attendances; the net result of years of hooliganism and poor facilities. Plotting the line of average football league attendances on the same graph we can see how despite fluctuations, over the long-term the attendances of Palace, and whoever there tenants are follow a very similar trajectory. If we calculate the correlation coefficient for Palace’s attendances and the league average we get a moderate-to-strong 0.64 which suggests that the variations in overall league attendances explain 41% of the variation in Palace’s attendances over the period shown. 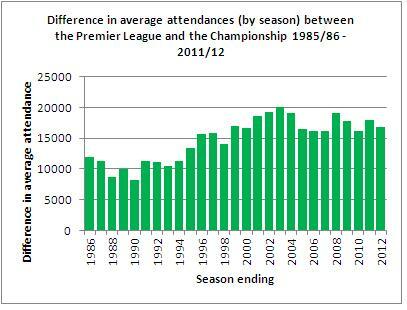 Ultimately the lesson from the graph is that when it comes to football attendances over a long-term period a rising tide really does lift all boats.